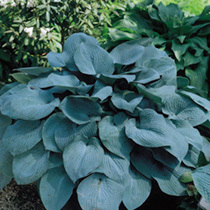 The chalky blue leaves retain their colour all summer and even continue to produce new leaves of this colour during the summer. Lightly fragrant lilac flowers are produced in late summer. 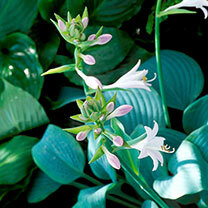 Ideal for a damp, semi-shaded spot, and perfect for masking the dying stems of spring bulbs. Flowers July-August. Height 40-50cm (16-20"); spread 90-100cm (3'-3'3"). Sensational foliage - with flowers that are an added bonus!